Meat Loaf is one of my favorite meals. Growing up, we had meat loaf often and when I moved out of my parents' house, it was one of the first things I attempted to cook. Over the years, I've tried many different recipes for meat loaf only finding one or two recipes that we'd never try again. 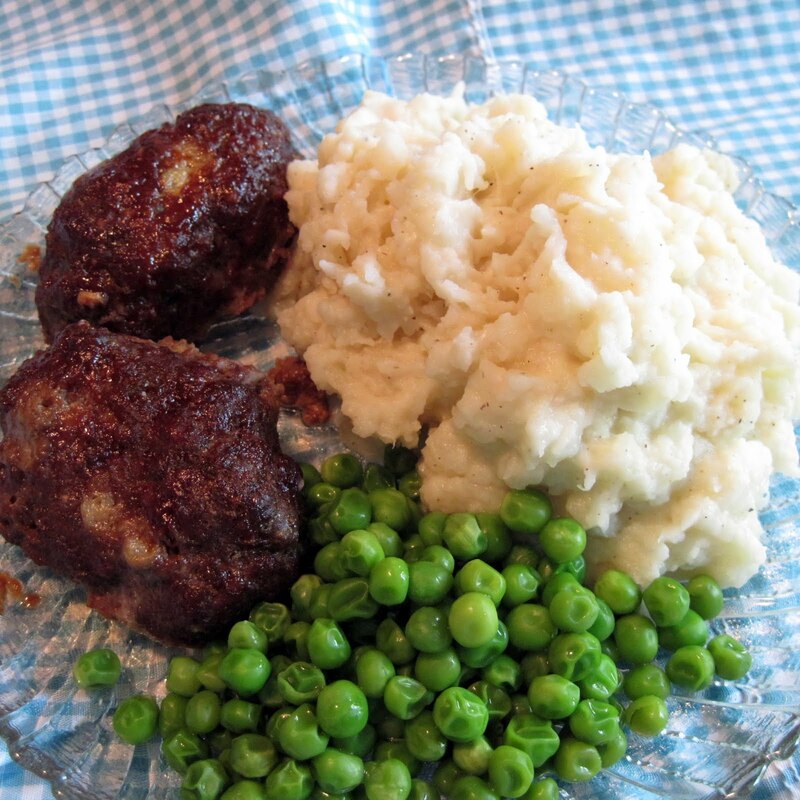 Our favorite, tried and true meat loaf recipe is Lisa's Old Fashioned Meat Loaf. While looking through the Betty Crocker Bisquick II Cookbook that a friend of mine gave me, I knew right away that I wanted to make the Mini Barbecued Meat Loaves. I adapted the recipe ever-so-slightly to fit our family's taste. I loved that this recipe called for Bisquick. Upon receiving this cookbook, I purchased my first box of Bisquick ever and am loving all that you can do with one box of "pancake mix"! I also loved the idea of using barbecue sauce mixed into the loaves for some added flavor! Plus, I enjoy any excuse to use some Butch's Smack Your Lips Barbecue Sauces! 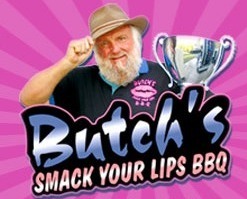 (Check out the Butch's Smack Your Lips BBQ End of Summer Giveaway...closes on Wednesday, August 24th, at 10pm). Set aside 1/4 cup barbecue sauce for topping. Mix remaining ingredients until well combined. Form meat mixture into 12 mini loaves. Brush with the reserved 1/4 barbecue sauce. Bake 18-22 minutes or until meat thermometer reads 160 degrees. This recipe is a keeper! In fact, we liked it so much that I've made this recipe twice already! Served with Cauliflower Mashed Potatoes and a green vegetable makes a perfect Sunday dinner. The loaves could also be cut in half to make meat loaf sandwiches! 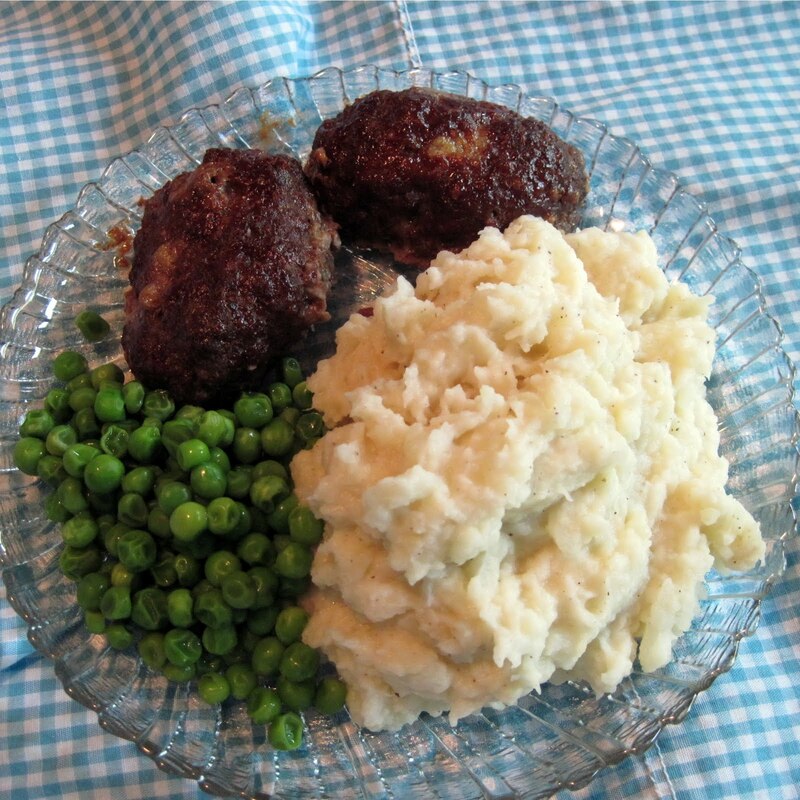 The individual meat loaves are great for portion control and freeze well for future meals! 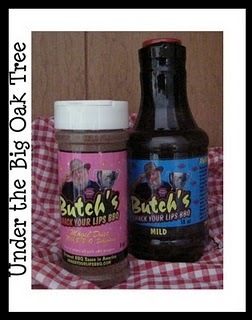 ***Be sure to check out the Butch's Smack Your Lips BBQ End of Summer Giveaway here at Under the Big Oak Tree! There are many ways to enter, including FaceBook-exclusive bonus entries! *** gievaway closes at 10:00pm on Wednesday! Last week was a difficult week. Grace was feeling a bit under the weather. We took her to the pediatrician on Wednesday and after a quick check-up and a prescription for an antibiotic, she is feeling much more like her usual self. I just took a peek at last week's menu and realized I only served 3 of the 6 meals scheduled. Most of the week, we ate leftovers from the 3 meals I managed to prepare. On Friday, I had a particularly bad day. I called Joe and told him that he had to figure out dinner. I wasn't cooking, I wasn't heating leftovers, I wasn't making decisions. Joe came home with a family meal from Boston Market! Perfect choice! We all enjoyed it! Especially, the cornbread! On Sunday, I finally got around to making waffles! It was my first attempt and I was really nervous. Silly, I know, but stuff like this intimidates me for some reason! I didn't take any pictures of the waffles, but they did turn out pretty good for my first try. I used the recipe off the side of the box of Bisquick. Remember I told you that I bought my first box of Bisquick a few weeks ago? Well, it's gone! I finished a whole box already! Joe picked up a new box so I can make some baked chicken cutlets this week! I still haven't made spaghetti sauce yet. I was planning on throwing everything into the slow-cooker on Saturday morning. Friday night, I ran downstairs to get the ingredients I needed and realized that I am out of homemade vegetable broth! How did that happen? Well, after taking a better look today (it wasn't in the usual spot) I found 2 freezer bags full of homemade veggie broth! So, tomorrow morning, I'll be throwing together a batch of sauce. Finally. Burritos, Cheesey Spanish Rice Bake. I wish I was able to make the Black Bean and Sweet Potato Chili last week so that I could make some burritos with the leftovers. Instead, we'll be using some burritos we picked up in the freezer aisle at Super Walmart last week. The Cheesey Spanish Rice Bake will be the perfect homemade sidedish to go with the convenience of the frozen burritos. Spaghetti with Meat Sauce, Garlic Bread, Fried Zucchini. 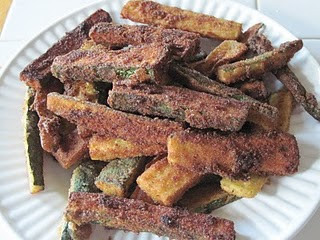 Since the sauce will be cooking in the slow-cooker, it won't be any problem finding the time to fry up some zucchini sticks! I'm sure they will be great dipped in some of that tasty sauce! Greek Chicken, Potatoes, Carrots. 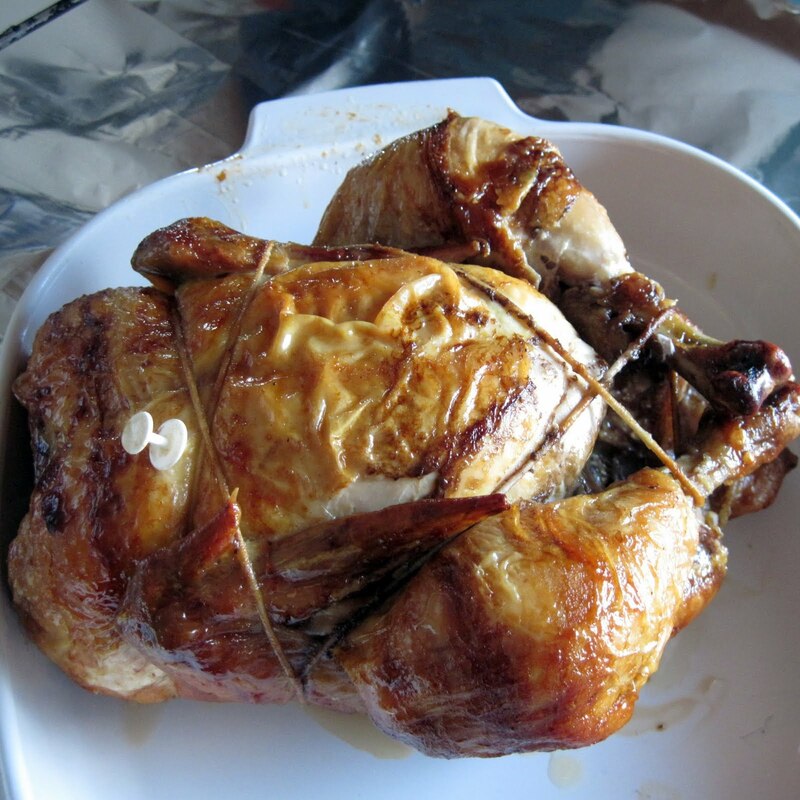 Since I never got around to making the rotisserie chicken last week, I'll go back to my original plan for that whole chicken I have in the freezer. 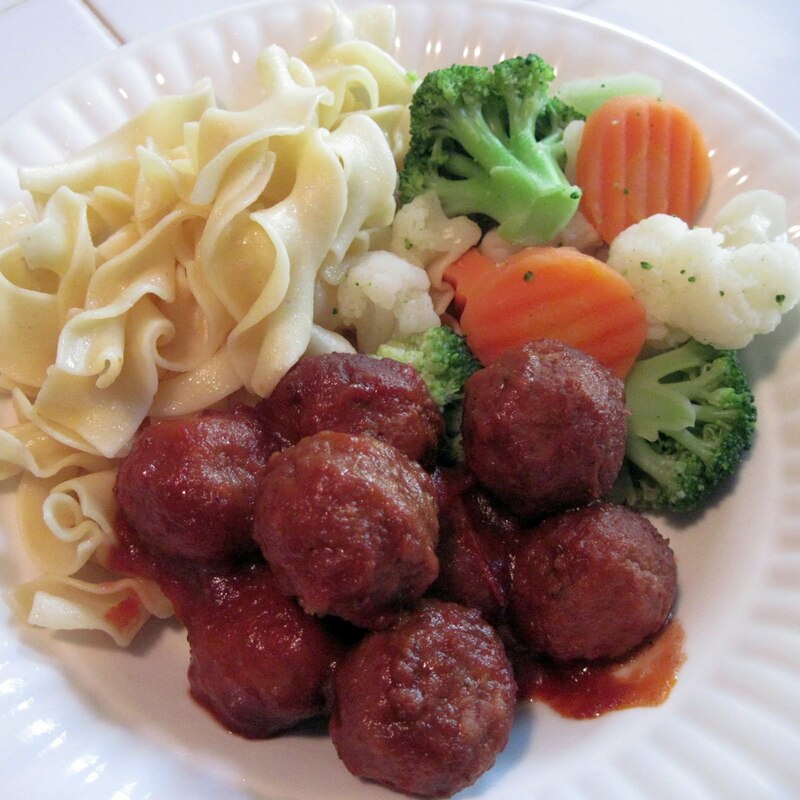 Sweet 'n' Sour Meatballs, buttered noodles, steamed vegetables. I love the ease of this meal. I'll toss everything into the slow-cooker in the morning and let it cook all day. 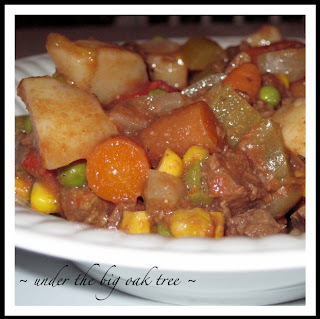 Easy Beef Stew, salad, biscuits. Mmmmmm. I love this recipe! It can be made in the oven or the slow-cooker. I can't think of a better way to use up all of the veggies in the fridge! Now, I want to know what your family will be eating this week! Share your dinner ideas with me in the comments OR follow me over to Menu Plan Monday to share your weekly meal plan! Wordless Wednesday ~ The Best Dog Ever! I'm so sorry for showing up so late to the Wordless Wednesday party. Grace has been feeling a bit under the weather this week, and it's been a bit crazy around here as a result. We took her to the pediatrician today, and she should be back to her usual self soon! 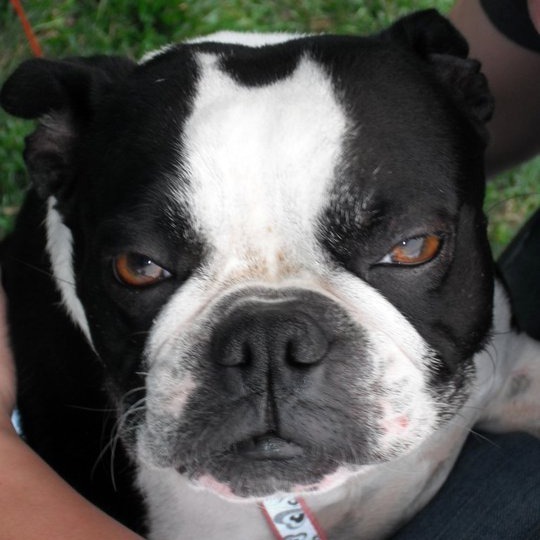 This week's Wordless Wednesday is dedicated to my sweet puppy. She turned 4 last month and is just the best! I know everyone says this, but I honestly think my Remmy is the sweetest dog ever! Just look at this face! 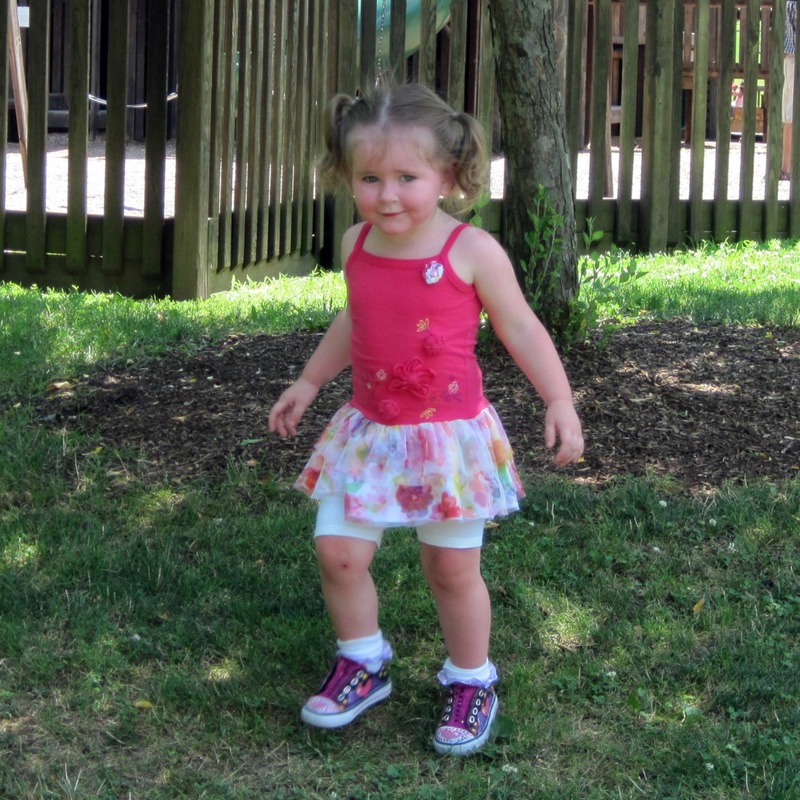 After being our only "child" for 2 years, we were really worried about how she would be once Grace was born. Nine months of worry for nothing. She loves HER baby! Loves, loves, loves her! Tonight, Joe was trimming Remmy's nails. Remmy hates getting her nails trimmed. Grace sat and watched the entire process and even watched Joe put the clippers away. About half an hour later, we walk into the living room (we were only in the kitchen for a few seconds) to find Remmy looking terrified while Grace walks toward her with the clippers!!! I really wish I would have been able to get a picture! The look on her face was priceless! Oh, the things that poor puppy goes through every day! But she loves every minute of it! Well, mostly! Needless to say, we have to find a new spot for the clippers! Oh, more importantly, it tasted great! Homemade broth (foil container) and reserved jambalaya (plastic container) from the freezer make a nice, hearty Cajun Red Bean and Rice Soup. 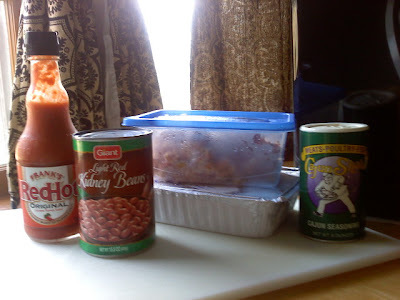 ﻿﻿ Just adding a few ingredients (shown above) turned that cup and a half of Jambalaya mix into a nice hearty pot of soup! The soup was another hit. I followed the recipe exactly as posted on the Food Network site. Homemade chicken broth from the freezer helped make this a very frugal meal! Serving the soup with salad and bread allowed us to enjoy this meal for 2 nights. For the second batch of the reserved mixture was intended to be used in another recipe from the Big Easy episode: Cajun Quesadillas. 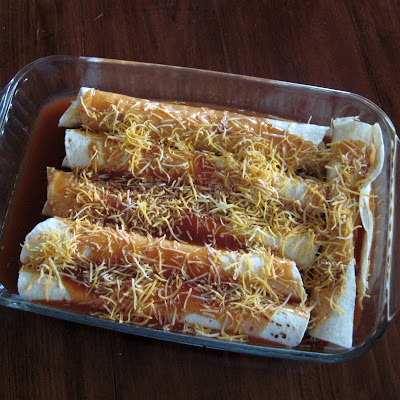 Instead, I decided to use the mixture as a filling for enchiladas. 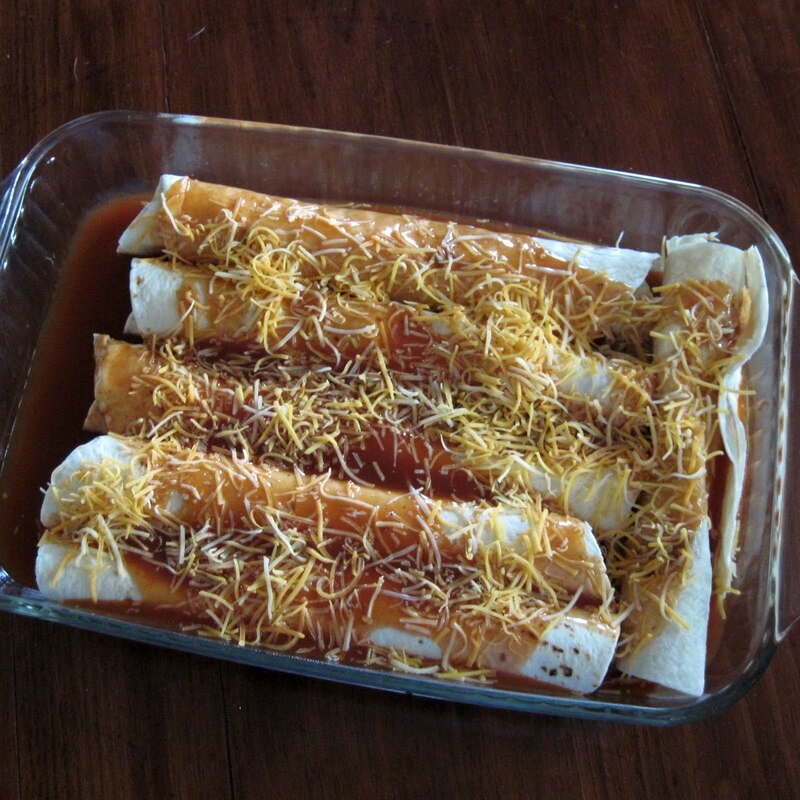 Enchiladas is always my go-to meal when I am in need of a simple, hearty meal. Especially if I have any type of rice/bean/chicken mixture already prepared in the fridge or freezer! 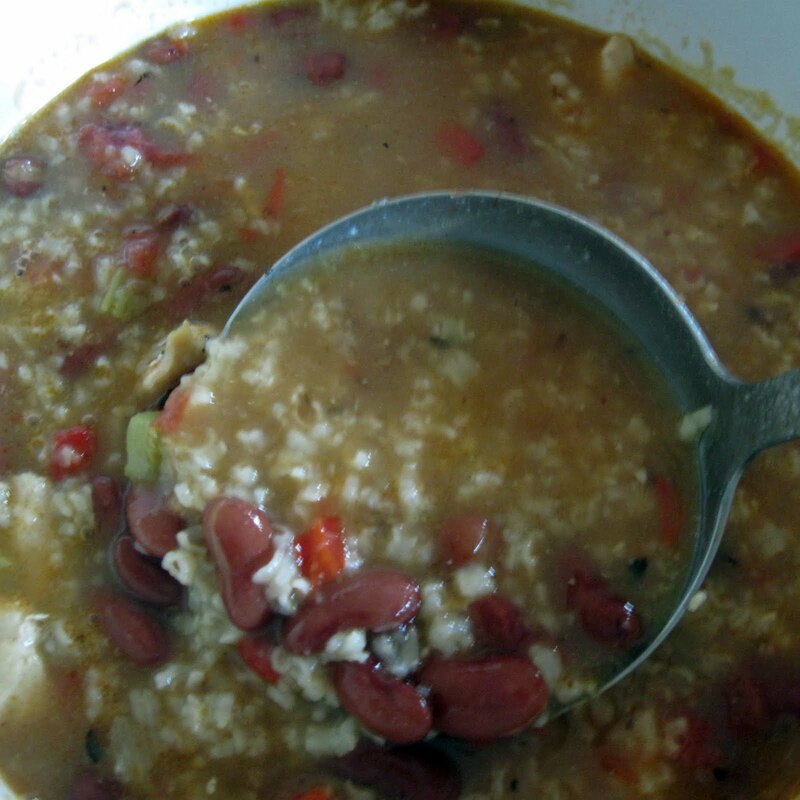 Adding some corn and black beans bulked up the mixture a bit and adding some taco cheese really helped to turn this Cajun-inspired mixture into an easy Mexican-inspired meal. 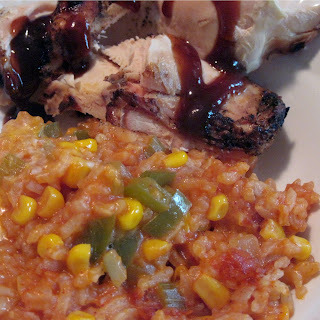 Add frozen corn and 1/2 can of enchilada sauce to the reserved Jambalaya. Thaw in microwave for 2-3 mintues at 30% power, stirring half way through cooking time. Add the black beans and 1/3 cup of the shredded cheese. In a baking pan lightly sprayed with cooking spray, pour 1/2 can of enchilada sauce. 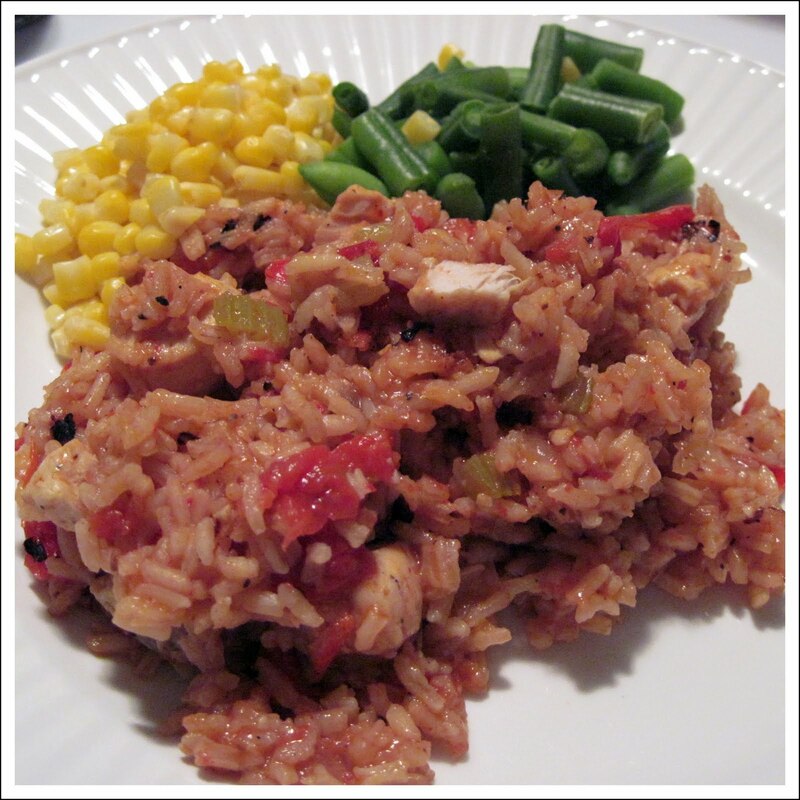 Fill each tortilla with 1/3 cup of the Jambalaya mixture, roll them up and place seam side down into the baking dish. Pour the remaining can of enchilada sauce over the tortillas. Bake in 350 degree oven for 20 minutes or until cheese is melted. Although this tray of enchiladas is much smaller than I normally make, we were still able to enjoy this for 2 nights last week! I'm a bit late in posting my menu plan this week. Joe had off today, so we ran some errands before Grace's naptime. We didn't even get that much accomplished this morning. The dreary, rainy day has us all feeling a bit lazy today. But I did manage to make dinner and organize a couple of kitchen cabinets while Grace napped. Even now, I am typing this post while doing laundry. Some of last week's meals will be rolled over into this week since we didn't get to everything on the menu plan last week. I ended up needing to make a few changes and additions to the menu to make up for poor time management on my part. Instead of making spaghetti with meat sauce, I decided to throw some frozen ravioli in the slow cooker. This is one of my favorite no-thinking-required meals. 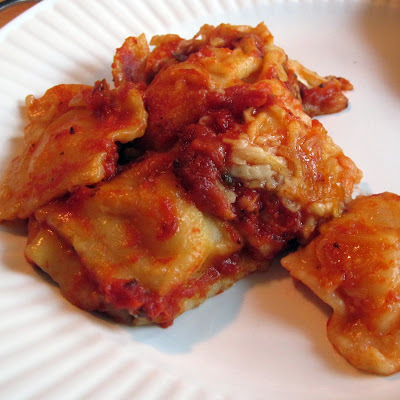 I was able to use up some cheese from the fridge that was nearing expiration, I used 2 small bags of ravioli from the freezer and a jar of sauce from the pantry. Super-easy and pantry friendly! We've been spoiling ourselves lately with take-out on the weekends. 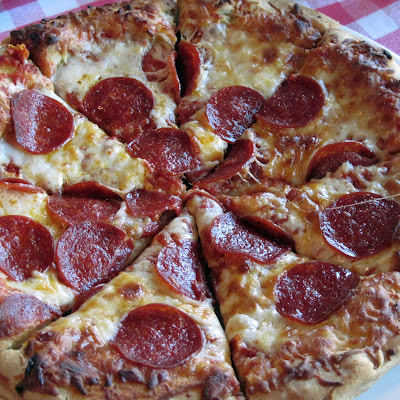 So as we got closer to the weekend, I started wanting pizza on Friday. Instead, I had Joe pick up a DiGiorno Pizza with Breadsticks from the freezer section of the grocery store. I popped the pizza and breadsticks in the oven and also reheated the ravioli from earlier in the week! This was a perfect (cheaper) alternative to take-out. About the only thing I did prepare from last week's menu plan was the corn on the cob, the fried eggplant and BBQ meatloaf. Molasses Baked Beans, baked potatoes, hot dogs, corn on the cob. 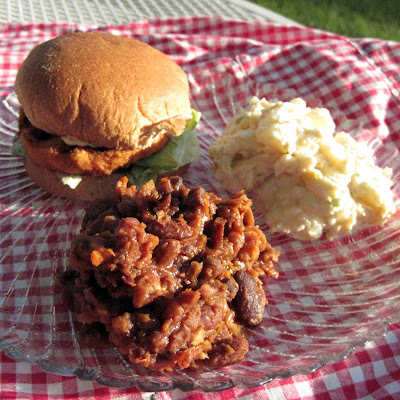 Molasses Baked Beans shown here with Salmon Burgers and Potato Salad. Applesauce Chicken, mashed potatoes, green beans. An easy slow cooker meal that Grace really enjoys....well, she did the last two times I made it...here's hoping she will gobble up this chicken dish again! Rotisserie Chicken, pasta salad, corn on the cob. Yep! Chicken two nights this week. Mainly because it's what Grace likes. But also because I have a whole chicken taking up space in my freezer! Homemade Rotisserie Chicken made in our Set It and Forget It Rotisserie Oven. Black Bean &amp;amp;amp; Sweet Potato Chili, white rice, corn bread. The dreary day we had today has me in the mood for some serious comfort food. 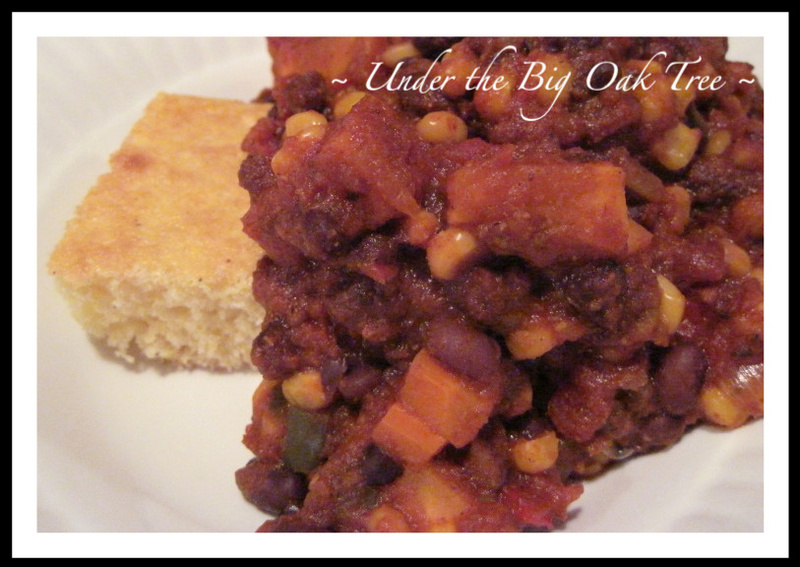 A big pot of chili served with rice and corn bread is one of my favorite gloomy day dinners. I'm not sure what the rest of the week brings, but if it's not cloudy and rainy this week, I'll make sure the AC is cranked up so we can enjoy our heaping bowls of this vegetarian chili! Sweet Potato Chili served over a cornbread square. 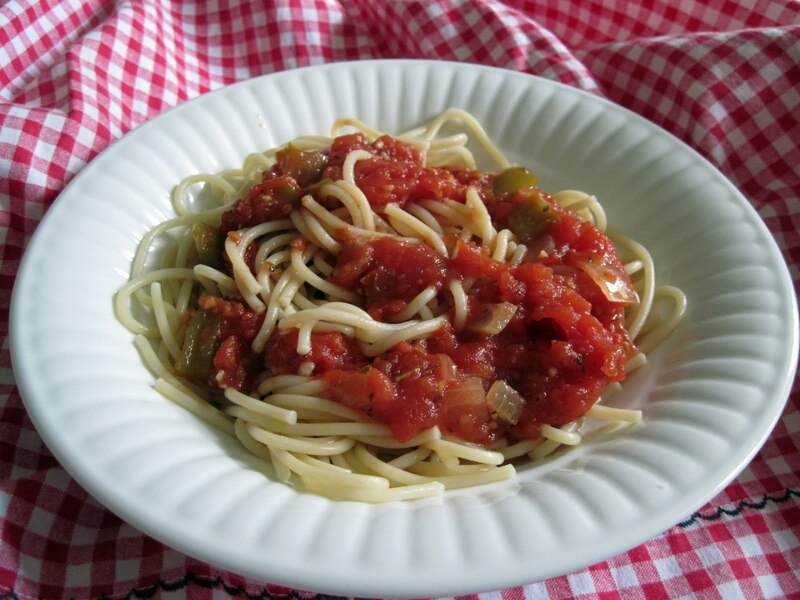 Spaghetti with All Day Slow Cooker Spaghetti Sauce. I'll be making this late in the week/weekend so we'll have plenty for leftovers next week and also some to freeze. I'm nowhere near emptying the freezer like I tried to do during my pantry/freezer challenge. Although, I said I don't want to do any freezer cooking, the sausage in the fridge needs to be used up, so a batch of this sauce will be perfect. Waffles, scrapple, fruit salad. Breakfast for dinner seems to be an every week thing in our house lately. That's fine with me, it's easy and it's frugal. Well, I hope the waffles are easy...I've never made them before! I know they were planned for last week, but it's one of the many meals we didn't get to last week. 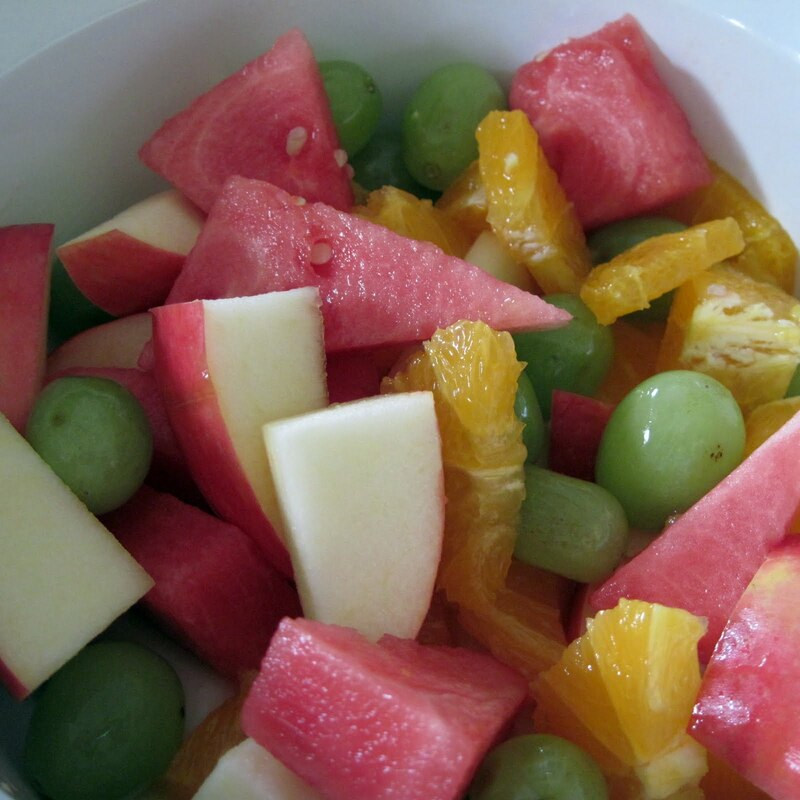 For more recipes and menu planning inspiration, be sure to visit Menu Plan Monday hosted by I'm an Organizing Junkie! Butch's Smack Your Lips BBQ End of Summer Giveaway! Wow! Summer is almost over and school is about to start. In fact, in some parts of the country, school is already in session! Looking at my friends' status updates on Facebook, I see a lot of mixed feelings about sending the kids back to school. Some parents had so much fun with their families this summer that they hate to see the summer end. Others just can't wait to put their kids on the bus. While the new school year doesn't affect my household at all, I will be sad to see some of our summer activities come to a close. But we do have a list of things we'd like to do with Grace this fall! As a special end of summer treat, Butch's Smack Your Lips BBQ has offered to sponsor another giveaway for Under the Big Oak Tree readers! Three winners will be selected via random.org. Each winner will win their choice of either Butch's Smack Your Lips BBQ Sauce OR Butch's Smack Your Lips Magic Dust Dry Rub. Be sure to check out the Butch's Smack Your Lips BBQ website if you're not familiar with their product line or to place an order for your favorite Butch's Smack Your Lip sauces! I'll be placing another order this week since I am almost out of sauce! Giveaway ends on August 24th at 10:00 pm EST. Three winners will be selected via Random.org. There will be several ways to enter. Be sure to leave a separate comment for each entry. Don't forget the mandatory entry should be done first in order for the bonus entries to be counted. Subscribe to this blog via email. (Use the buttons at the top right sidebar.) **2 entries** leave 2 comments. 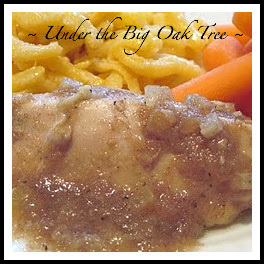 Like Under the Big Oak Tree on Facebook. (Use the buttons at the top right sidebar.) **2 entries** leave 2 comments. Follow TheBigOakTree on Twitter, let me know your Twitter handle/id in your comment/entry. (Use the buttons at the top right sidebar.) **2 entries** leave 2 comments. Tweet this Giveaway and provide the link in your comment here. **3 entries** leave 3 comments. Blog about this Giveaway and provide the link in your comment. **3 entries** leave 3 comments. Daily, on Facebook, I will post ways for you to earn bonus entries. Follow the instructions on those facebook posts to qualify for bonus entries! Giveaway will close on August 24th at 10:00 pm, EST. Three winners will be chosen by random.org and contacted by email. Winners will also be announced in a new blog post and will have 48 hours to claim their prize, otherwise a new winner will be selected. Earlier this summer, a friend of mine gave me a stack of cookbooks that she was no longer using. In the pile, I found 2 Bisquick cookbooks and started looking through the recipes. That's when I learned that Bisquick is so much more than just a pancake mix! Now, it's time for me to make a couple of confessions. I've never purchased a box of Bisquick before. Really. Never! I don't even think I remember ever seeing a box of it in my Mom's kitchen when I was growning up. Not only have I never purchased/used a box of Bisquick, I've also never made pancakes before. Growing up, my Dad was usually in charge of the big weekend breakfasts. And now, Joe is more likely than me to make a big Sunday morning breakfast. Heat griddle or skillet; grease if neccessary. Stir bisquick, milk and eggs until blended. Pour or ladle 1/4 cup batter onto hot pan. Turn. Cook until golden brown. Since making the blueberry pancakes for breakfast that morning, I also made them for dinner last week. I've also tried a few more Bisquick recipes and have many more that I still want to try. 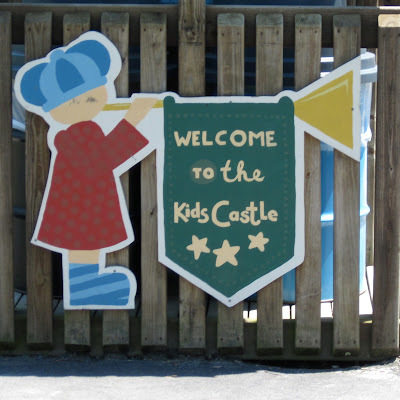 A couple of weeks ago, we had a free weekend and took Grace to Kids Castle. I've been wanting to go for a long time. A really long time. Actually, since before Grace was born! I have heard so many great things about the 8-story, wooden playground sculpture (located in Central Park in Doylestown Township) and let me tell you, this place is great! Grace is a little young for the 8-story castle, but that didn't stop her! I followed her into the castle and helped her with some of the ladders and ropes and she really had a great time! 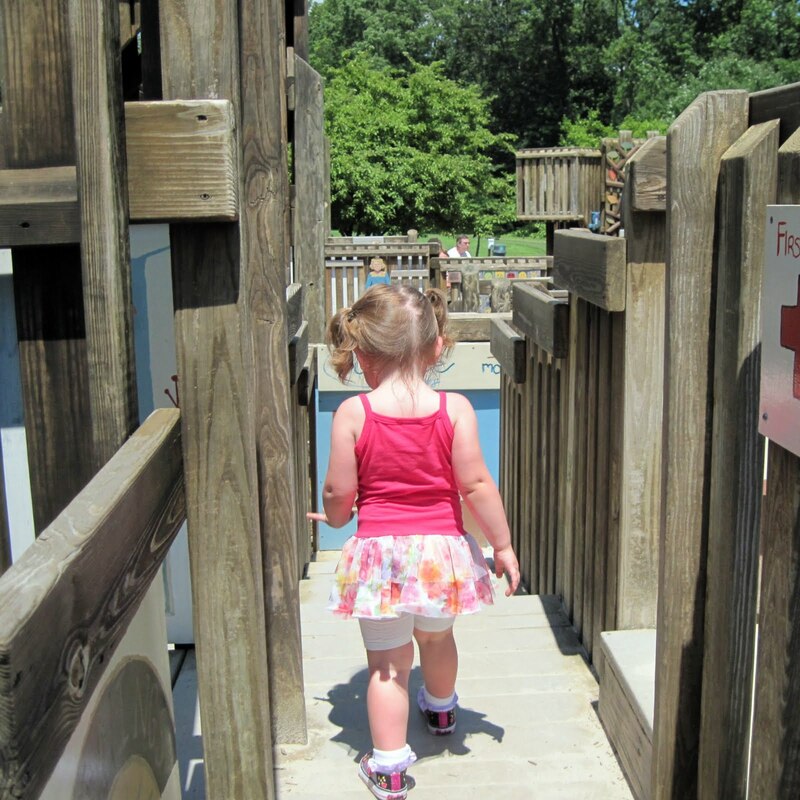 The park also has a toddler area that she enjoyed, too! We chose a very hot Saturday to visit the castle. There were a couple of birthday parties going on in the pavillions at the park. So, it was a little crowded in addition to being extremely hot. Due to the heat, we didn't stay very long. 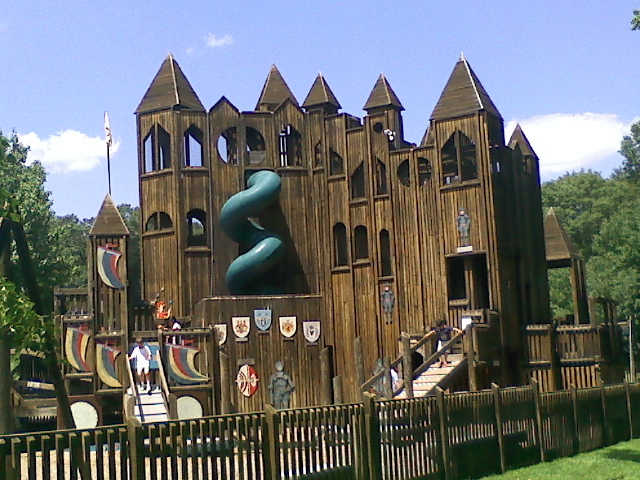 Just long enough to explore the inside of the castle and a little of the surrounding area. I'm looking forward to taking another trip to the castle on a much cooler day! Can you tell I had a great weekend? It was a long, hot and exhausting weekend. But it really was a great one! I may have mentioned before that my basement is starting to look like it should be the topic of the next episode of the reality show Hoarders. Everything we brought from our apartment (10+ years worth of stuff) was stored in our basement. Added to that was boxes and boxes of stuff that was in my parents' attic. Things that were in my room in their old house when I was a kid/pre-teen/young-adult. So, what's that? Like 40 years worth of memories (and junk)? For months, my friend Barb and I have been trying to pick a date to hold a yard sale. On Wednesday of this week, Barb called me to see if I wanted to hold the yard sale over the weekend. Knowing that I wanted to unload some stuff, I agreed, even though I thought it was too short notice to really manage a decet sale. It's one thing to know that you want to have a sale, it's another to actually sort through all those years worth of stuff to determine what will be kept and what will be sold. Plus, everything has to be priced. I only have time to do things like that when Grace is asleep. Of course, both Wednesday and Thursday nights she was not willing to cooperate at bedtime. But on Friday we sorted through a lot of stuff and got everything priced and ready to sell on Saturday morning. Barb and I sold a lot! More than half of all the items we put out sold! Most of what is left will be taken to our local thrift shop to be donated. Even with all that sold, I still have a lot more stuff to sort through in both the basement and the attic, so I am hoping to have another sale in the early fall. Our neighbors want in on that one after seeing how much traffic we had on Saturday! Anyway, In addition to being very tired, I feel very happy and very accomplished today and am very excited to jump back into menu planning. Although we are still trying to use up what's in our freezer and pantry, we did do a larger shopping order this weekend to pick up some boneless chicken breast, some ground beef and some fresh vegetables. What we bought today, should last us a couple of weeks if not more. I will still be focusing on using as many ingredients as I can from our freezer and pantry. 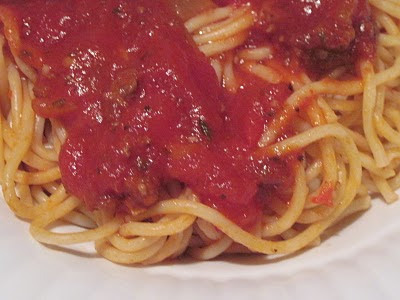 Spaghetti with Simply Tomato Sauce, Fried Eggplant, garlic bread, salad. 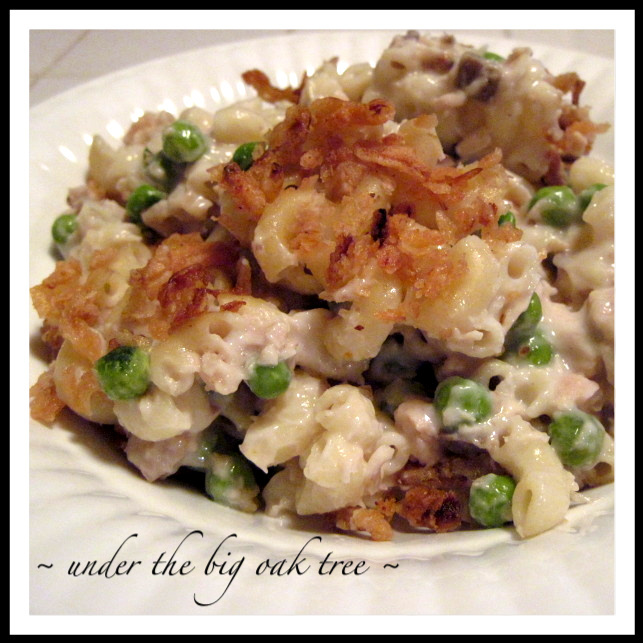 Tuna Noodle Casserole. MMmmm. Comfort food! After breaking down and ordering take-out over the weekend, I am in serious need of some comfort food. I'll check out the weather to see if there is going to be a cooler day to prepare this. 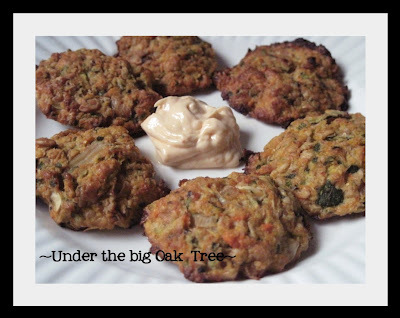 Baked Veggie Fritters. I plan on making up a batch of these tasty veggie patties and eating them with meals through out the week. They are great as a snack or quick lunch too! Waffles, Turkey Bacon, fruit salad. Last week, we had breakfast for dinner twice (three times if you count the leftovers!) We had blueberry pancakes and Scrapple in the beginning of the week. Then it was french toast and turkey bacon later in the week. After finding my never-used waffle iron while sorting through all of the many boxes in my basement, I decided that this week will be my first attempt at ever making waffles! What are you serving for dinner this week? Share in the comments or follow me over to I'm an Organizing Junkie and join in the Menu Plan Monday fun! Also, check out my previous post about FREE Activia Selects Yogurt! Have you tried Dannon's Activia Selects Yogurts yet? Would you like to be able to print out a coupon for FREE (up to $3 value) Dannon Activia Selects Yogurt? I love Activia yogurt, but Greek yogurt is new to me. 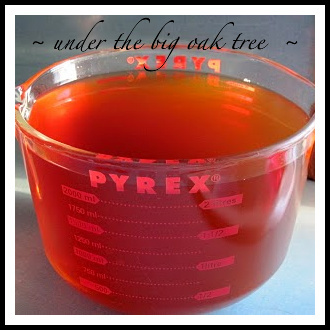 So I am really thrilled to be able to try it out using a FREE printable coupon! Click the link below to get your coupon! I was monetarily compensated by Foodie Blogroll and Activia Selects for letting you know about this product.